Hey. We’re not completely heartless. We’re not begrudging anyone the chance to celebrate love. But for those of us that are reluctant to pay over the odds for red roses and a set meal at a crazy busy restaurant, we’ve got some alternatives for spending the 14th either with your bestie, your valentine-phobic better half, or your sweet, sweet self. On first glimpse you might think The Vegetarian is a harmless fiction about a foray into a meat-free diet. Think again. One night, Yeong-hye has a dream, immediately stops eating meat and decides she no longer needs or wants her husband. Dark and borderline traumatising, this is the read for a 'don't need nobody' moment. Buy it here. Share some floral love with your bestie. Deliver the Effie bouquetto your #1 ami, full of roses, phlox and ageratum in pinks and purples. The beauty is in the letterbox packaging, meaning ‘we missed you’ courier notes are a thing of the past. And make it even sweeter with 14% off any letterbox or hand-tied bouquets from Bloom & Wild with the code SMOKEY. Stop firing up Netflix, flicking about for a bit and then closing it. The Sinner is an extraordinarily chilling series centring on a young mother who brutally kills someone in public and has no idea why she did it. 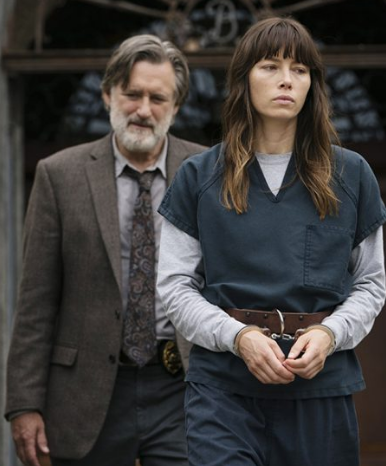 Jessica Biel is encapsulating in the lead role while Bill Pullman's world-weary, heavily flawed but ultimately kind-hearted cop, is a career best. TV doesn't get less Valentinesy than this. Watch here. Looking after number 1 should be a top priority year round. For a super spesh bit of you-time, Honest are on hand. Book into their Kings Heath treatment room for an aromatherapy massage combining essential oils to make a massage just right for you. This is Honest at its natural, aromatic best. It's £54 for an hour of the good stuff. Those lovely folks at 40 St Paul'sare doing their thing to help the not so willingly single amongst our number. Their Singles Awareness night on the big day features Cards Against Humanity to take the awkwardness out of the dating game and specially crafted drinks help take the edge off too, obvs. If you're newly single or looking for vindication that relationships just aren’t worth the hassle, then anti-romance 500 Days of Summer might be the answer. It refutes everything a romantic comedy should be, clichés and happy-ever-afters are nowhere to be seen. Watching with friends and something Deliveroo-able is our serving suggestion.